Form Description: Being able to provide a service estimate is vitally important when running a cleaning service. After all, there are many times when a potential client will call up and request an estimate before they will agree to go with a particular company. With this Home Cleaning Service Estimate in hand you will be able to provide exactly that. Not only will you be able to provide a complete breakdown of the estimated costs for each room and service that you offer, but also the amount of time, and the total estimated cost. 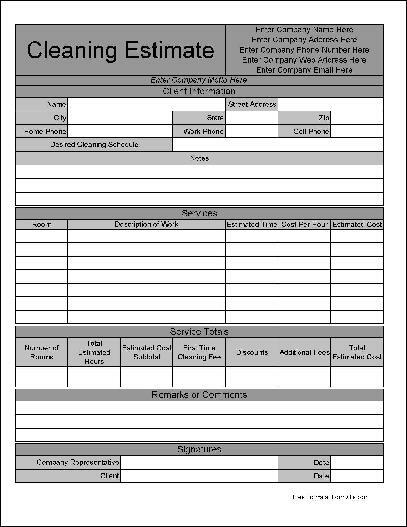 This form will definitely help you serve your customers better. This particular edition of the Cleaning Estimate has been formatted to allow you the option of personalizing it. What better way to have your potential customer remember how to contact you, then by putting your name on the actual estimate? In addition, this form also has extra wide rows. These rows will allow you an easier time of entering the information in by hand if that is what you desire. You can download a PDF version of the "Personalized Wide Row Home Cleaning Service Estimate" form absolutely free. You can also, for a small payment, download a fully editable version of the form that you can customize as you desire. (Don't know which format to choose? Here's how to make your choice.) What would you like to do? Formville's free "Personalized Wide Row Home Cleaning Service Estimate" form is associated with the following keywords: Cleaning, house keeping, maid, service, estimate, personalized, wide row.